Home India Indian Artists Portal Vishwamohini: An Excellent Portal For Indian Classical Music Enthusiasts and Artists. 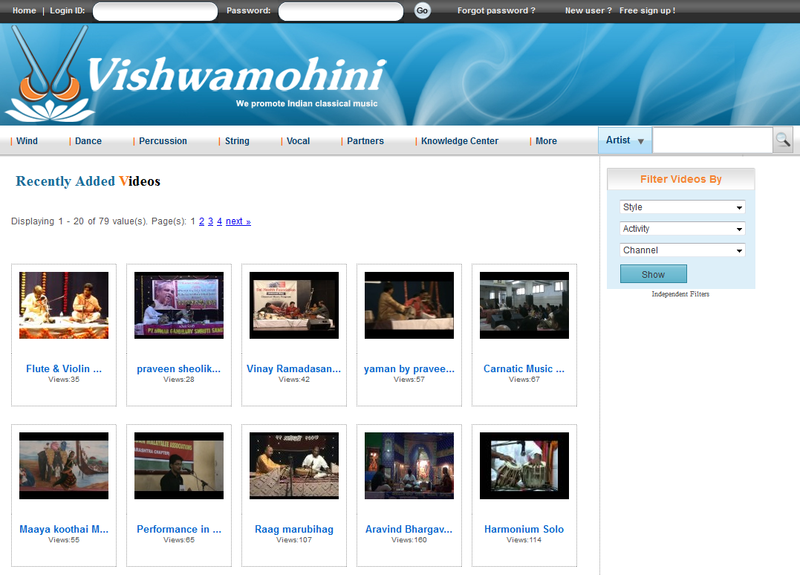 Vishwamohini: An Excellent Portal For Indian Classical Music Enthusiasts and Artists. Vishwamohini.com is a excellent portal for Indian classical music lovers and artists which got popular after its recent launch. If you are Indian classical musician, Lover or contributor, then this portal is definitely for you. You can watch profiles and videos of Indian classical musicians. Beauty of this portal is, Artists can embed videos where he/she is performing artist and with every video you can find information of other artists performing in video. So this is the most authentic portal ever of Indian classical musicians. Simply register yourself and you can embed videos from YouTube (Only for Artists) , post concert information or participate in question and answers. Users can create portfolio of their favorite artists and videos. Navigation and filters are intuitive features of Vishwamohini. Users can easily filter artists by their skills and location so it very easy to find artists from your location or a location near yours. Filters are also available for videos, so finding video of your choice is a click away. Many cool things are planned in near future. So stay tuned and enjoy the authentic Indian classical music.